The village of Skaneateles, New York is as charming a place to be in March as it is any other time of year. At the beginning of the month you feel the cool, crisp air hit your face as you leave your Skaneateles lake vacation rental and stroll the cozy streets bundled up to stay nice and warm. If you are staying in a luxury vacation rental you can enjoy the warmth of the fireplace at night and spectacular views of the ice-glazed lake during the day. Towards the end of the month the weather becomes increasingly milder. Whether you are here when winter is roaring or turning into a lamb, there is always some type of local entertainment to enjoy in and around this scenic town. Many people that come to Skaneateles for a visit enjoy going outside and taking a stroll to see what the atmosphere is like. While March madness takes over the TV’s here too, you can step outdoors for a refreshing walk around town. The town sometimes feels like it’s been ripped out of a travel postcard, it really is beautiful, especially around the lake. Go out for dinner and enjoy local cuisine with a glass or two of Finger Lakes wine. Take in a live theatre show or movie and then return to the comfort of your Skaneateles luxury rental. Every once in a while it is a good idea to take a break from it all and refresh your mind, body and spirit. Shake off those winter blues and stresses by taking part in a relaxing wellness retreat. Under the care of skilled instructors you can learn basic yoga moves. Yoga is especially rejuvenating to the body. Discover how to stretch out all of those kinks that keep your neck, shoulders and back in constant knots. Learn how to take good care of yourself in wellness workshops. After a day of yoga come home to the warmth and comfort of a Finger Lakes luxury rental. In honor of St. Patrick’s Day and all things Irish the Cayuga County Chapter of Habitat for Humanity is sponsoring this traditional Irish party. Hooley is an old Irish expression for party. Keeping with tradition there is going to be lots of great music, food and, of course, drink. The Flyin Column dance group provides live entertainment. There will also be a silent auction. For tickets call 315-246-2269. For the most part, Skaneateles is pretty quiet and serene during March. This makes it a great place to escape to for a short weekend getaway. Visitors are always welcome and you may discover some things about this part of New York State you didn’t know before. 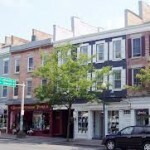 Skaneateles is rich with history and natural beauty. Reserve your Skaneateles vacation rental now. Planning a trip to the Finger Lakes area in March? Great. You’ll be able to enjoy the last gasps of winter cold and snow giving way to early signs of spring. March brings out the spirit of celebration and fun in several ways. If you are a sports fan, we have Skaneateles vacation rentals that are within easy driving distance of Syracuse and major college basketball. If you want to get out and shake off those winter doldrums, check out the local Mardi Gras and St. Patrick’s Day events. There are cultural events happening all around the Finger Lakes region this month that appeal to a variety of tastes and interests. Looking for a way to celebrate Mardi Gras? The popular Cayuga Wine Trail is hosting special Mardis Gras festivities. Go on a fantastic wine tasting tour and receive complimentary gifts like colorful beads to string around your neck, a nice wine glass, recipe cards and delicious wine and food pairings. Participate in the fun scavenger hunt along the way and then return to the warmth and comfort of one of our vacation rentals in the Finger Lakes region. Have you always dreamed of being a cowboy or cowgirl? Here’s your opportunity to find out what this lifestyle if really like. The Painted Bar Stables is offering this unique ten week course (Sundays) for aspiring cowpokes that wish to learn about horseback riding, horse behavior, trail riding, blacksmithing, leather work, barrel racing, working cattle, emergency veterinary skills and American folk music among other things. Course instruction is by Erika Eckstrom and Joe Chicone. Classes include two hours of hands on work time. Enjoy an evening of classic film and fashion. The Cornell Cinema is partnering with Petrune to bring you this wonderful event. The evening starts off with a live fashion show with models showing off vintage couture styles inspired by the movie Funny Face. Afterwards, stay and watch a special showing of the classic Funny Face film starring Audrey Hepburn and Fred Astaire. Hepburn plays a humble bookworm that is turned into a fashion model by a photographer who sees something special in her. The movie features beautiful fashions from the 1960s era and memorable music. After dinner and the show come back to one of our luxury Finger Lakes rentals and bask in the warmth of the Finger Lakes. Help solve a mysterious murder as you make your way along a wine trail’s worth of clues. While you are figuring out who done it enjoy tasting exquisite Finger Lakes fine wine from local vineyards. Can you collect enough clues to put all the pieces of this murderous plot together? This mystery is solved while indulging in a delectable three course wine dinner at Simeon’s On The Commons restaurant. The Glenora Wine Cellars invites Elton John fans to come out and celebrate his amazing music while feasting on the finest of local cuisine. The talented Lee Alverson provides live entertainment. Meal selections are paired with local wines. You don’t need to find a yellow brick road to have a good time. No matter what you are looking to do around the Finger Lakes region, Fingerlakes Luxury Rentals has a luxury rental property that will complete your vacation.